Literally. I was so sick on Friday I thought I was going to have to go home. Being a teacher and being sick are two things that do not mix. On Tuesday I upped my dosage to 1000mg a day, 500 in the morning and 500 in the evening. So yesterday morning I ate yogurt and blueberries and when I got to work took my pill. About 45 minutes after taking I became dizzy and unfocused. Everything seemed to be spinning, and the kids idle pratter didn’t make any sense. I felt better when I sat down, but the nausea started. I tried to eat something, although what it was escapes me…… I had a massive headache. I sat in my corner and directed my class from afar, luckily they are good kids and don’t really need me once they know what to do. At lunch I gave in and bought school lunch, chicken sandwich (mystery giblets, cartilage and white bread) over cooked carrots and frozen blueberries with marshmallows? Seriously, no wonder our kids don’t want to eat at school. And half a candy bar. As soon as my blood sugar rose my headache cleared and I felt fine. I don’t understand how I am supposed to make it through the day feeling so terrible. My low carbohydrate snacks did nothing for me. when I came home the daily camera had an article on the best pho in the area, and so J. And I went out for dinner. 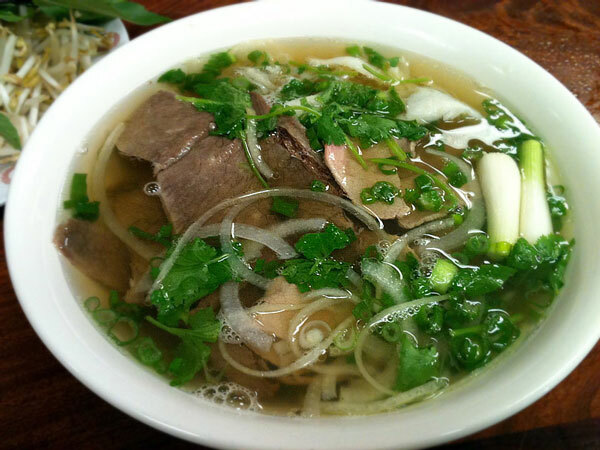 I do believe that pho might just be one of the worlds most perfect comfort foods. as you might notice homemade pho is sort of a pho-cking nightmare to prepare, so you might as well anti up the $8 and go out. Place the beef knuckle in a very large (9 quart or more) pot. Season with salt, and fill pot with 2 gallons of water. Bring to a boil, and cook for about 2 hours. Skim fat from the surface of the soup, and add the oxtail, radish and onions. Tie the anise pods, cinnamon stick, cloves, peppercorns and ginger in a cheesecloth or place in a spice bag; add to the soup. Stir in sugar, salt and fish sauce. Simmer over medium-low heat for at least 4 more hours (the longer, the better). At the end of cooking, taste, and add salt as needed. Strain broth, and return to the pot to keep at a simmer. Discard spices and bones. Reserve meat from the beef knuckle for other uses if desired. I am curious to know whether you chose to go back on metformin during your pregnancy. I am currently taking it, however, I am not pregnant.. yet.. =) I just recently got my monthly much earlier than I have in the last 8 months, so, I can only hope that the metformin is helping. It did make me feel ill at first, all foggy and stomache achey.. but, I have changed my diet to low carb, low sugar.. and I started adding apple cider vinegar to my daily water intake, so, I believe that helped with the nausea… Sorry for the long story, I am just wondering about the metformin during pregnancy. Congratulations on the little miracle by the way! This was my second round of prescribed drugs. The first time I took metformin I had the same awful symptoms but powered through. It did get better! I lost 20lbs and it regulated my periods, win win. But I freaked out, as I realized that I was able to get pregnant, so I stopped taking it. This time around I was taking it to try and lose a few pounds and increase my chances of getting pregnant. I was only using it for a month. As soon as I found out I was pregnant, around 6 weeks, I stopped taking metformin. I did not start taking it again. (I have a brand new, unopened bottle in the cupboard, because I filled the prescription and bought a pregnancy test at the same time) My reasoning was just intuition and not based on medical studies. I wanted to have as clean of a pregnancy as I could. I felt uncomfortable putting unknown substances into my body, blood stream and baby, as I was now the host of a very small dependent thing. If it made me feel so badly, what were the consequences to my baby? One woman I know who continued to take metformin through her pregnancy had a premature baby, who suffers from terrible allergies and eczema. Was it because of the drugs? Possibly. But I don’t know her whole story. Always speak with your dr. about what is right for you! Wishing you the very best!